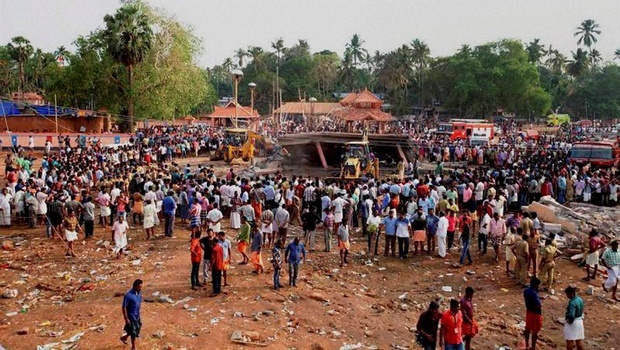 "Sampath Speaking" - the thoughts of an Insurer from Thiruvallikkeni: Puttingal temple tragedy ~ some insurance angle ! Quite an exhaustive coverage with valuable information on the insurance angle too! Sadly reflects the administrative lapses and also the tardy responses during such tragic emergencies. Recent bridge collapse and the precious lives lost in Kolkatta too will affirm the need to revamp the swift response the key government agencies to atleast rescue the injured and render immediate medical assistance. Again, in our country choppers are meant for CM's usage alone, never used as an air-ambulance. In abroad, even animals are rescued through chopper services. Pity here, our people do not seem to enjoy the status enjoyed by the animals there. Picking up from your insurance angle, it is high time, both Fire and Liability insurance is mandatory for a higher coverage amount by the authorities concerned. In our locality, the police department while issuing the explosives license to the shopkeepers during Deepavali eve insist only for Fire policy. Sharing your grief and looking forward to the times our folks get to treated humanely at all times!